When the head coach of the Cavs resigned, my eighth grade self had a master plan for the future of the franchise. When I was in middle school, I was obsessed with basketball. It was the early ’90s, the golden age of the NBA. And in Cleveland, we had a pretty damn good Cavs team. Brad Daughtery, Mark Price, Larry Nance. There was just one problem. He dominated the Cavs virtually every time — especially in the playoffs. He (almost singlehandedly) knocked their best teams out of the playoffs year after year after year. On May 24, 1993, after yet another disappointing Cavs playoff exit at the hands of Michael Jordan, coach Lenny Wilkens resigned. And as a precocious eighth grader, I knew who should replace him. Now, believe it or not, I didn’t have any head coaching experience in the NBA — or at any level. I had played one year of middle school basketball, bought a few basketball cards and that was about it. But I didn’t think that mattered. I figured the NBA players would just automatically respect their coach, even if he was still in the process of growing armpit hair — plus they were so good, they could more or less coach themselves. 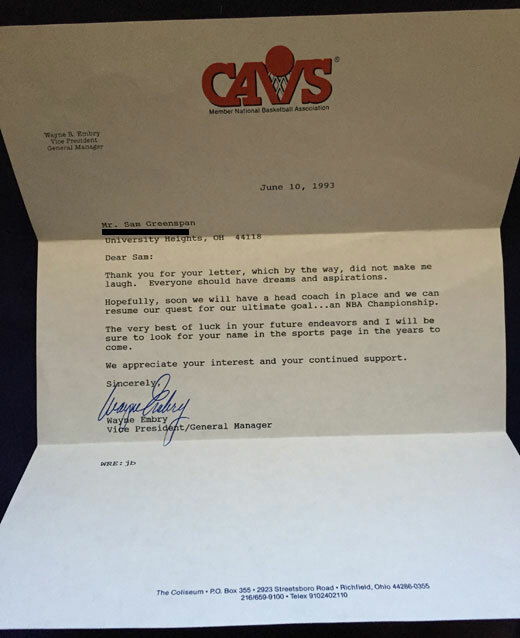 Last week, while I was just visiting my parents for Passover, I found the rejection letter from the longtime Cavs GM, Wayne Embry. It was still in its original envelope. That’s an awfully nice letter, especially in an era before people wrote letters like that just for the Instagrammability. It wasn’t particularly precient; I didn’t wind up going into sports (or even sports journalism), but I appreciate the motivation. It was really nice to have someone wish me luck in my future endeavors; at age 13, I didn’t realize that was the line companies use on people when they get fired. And sadly, 22 years later, the Cavs are still on that quest for the ultimate goal of an NBA championship. Which means, above all else, they might as well have hired me. I would’ve been just as good as Mike Fratello.